Artificial inseminator, District coordinator Jobs. For these jobs can apply from 01-04-2019 to 20-04-2019. 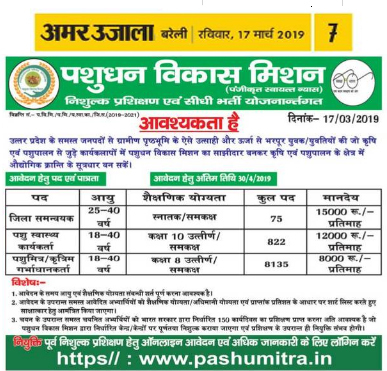 Further details can refer the official website pashumitra.in for Uttar Pradesh Pashumitra Animal health worker, Artificial inseminator, District coordinator. Available vacancy, Salary, Important dates, Selection Process, Application Procedure, Qualification are maintained below. 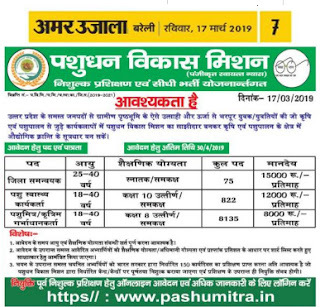 Animal health worker, Artificial inseminator, District coordinator Govt Jobs In UP Pashumitra. Pashudhan Vikas Mission (UP Pashumitra). Starting Date to apply for Animal health worker, Artificial inseminator, District coordinator Jobs: 01-04-2019. Ending Date to apply for Animal health worker, Artificial inseminator, District coordinator Jobs: 20-04-2019. Candidates must Pass 8th/ 10th/ Graduate. Candidates will be selected based on Experience, Document Verification. For District coordinator Jobs: 25-40 Years. Apply online at pashumitra.in. Last date to apply online is 20-04-2019.